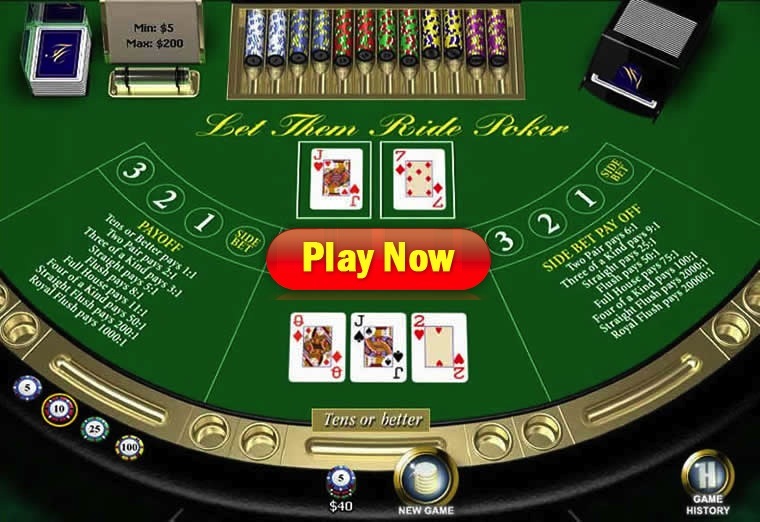 Let It Ride Poker - Find Casinos | Learn The Rules and More! There are all kinds of casino poker games out there, but none of them use a similar concept to Let It Ride Poker. It’s a truly unique game that uses the concept of three betting rounds – preflop, flop and the turn. Players are forced to make 3 wagers of equal size before any cards can be dealt, but two of these can be claimed back. This wouldn’t be anything out of the ordinary, but even when 2/3 of your wager are claimed back, payouts can still be awarded. Let It Ride seems to feature most of its popularity in the US, which isn’t a surprise as the game has been developed exactly there. However more and more players from EU, Canada and Australia are enjoying this game. This guide on Online Casinos should come quite handy for finding the best casinos to play this game at. Back to the rules & gameplay now, though. Similarly as most other casino card games, this one is also really easy to learn and play. The only foundation you might need is awareness of poker hand rankings. Other than that, everything is put on a golden plate right in front of you. Bonus – if you’re conviced that the next hand dealt will be equal or better than two pair, place a wager on this betting circle. You can win a payout of up to 20,000 to 1 ! Ante – quite common wager in casino poker. This is the only wager that is required and without whom the game can’t be played in the first place. ”1” – after the initial 3 cards are dealt, you are now facing a decision. Whether to leave your first wager up and ”let it ride” or take it off by choosing to ”pull out”. The hand will continue regardless of what you choose so if your hand does not look too promising, it’s probably worth it to pull it out. ”2” – once the fourth card opens, you have the same choice again – either let it ride and leave your wager on the table or pull it out. … and that’s it! Well, not quite, but it’s pretty close to that. Once you’ve decided whether to pull the last card or not, the showdown occurs. To qualify for a payout in let it ride, you’ll have to hold at least a pair of tens or better. If you hold a hand that is equal or better, you also qualify for increased payout odds – according to the paytable that will be show in the next paragraph. There are two types of payouts and one thing that differs this game from ones like Caribbean Poker or Casino Hold’em is that you don’t play against the house. Well, of course you do technically, as it’s the casino who pays you out and takes your money. What I wanted to say is that there is no hand for the dealer and all play is based on the payout table. You need to hold a hand equal or better than a pair of tens to earn a payout for regular bets and two pair or better for your bonus bet to be paid off. Take a look at both paytables, first of whom is most important one, regular pay-table that shows payouts for ”ante”, ”1” and ”2” bets. There are certain rules that will help you to reduce the house edge in Let It Ride to a rather small 3.48%. This doesn’t mean that you’ll be able to print money playing this game, but it certainly improves your chances of winning in a single session. Three suited cards that create a progression – 3, 4, 5 all of the same suit, for example. A GutShot Straight Draw with 4 high cards (higher than 10). You are now all set to enjoy a great experience and ready to play let it ride online, but not yet all that experience with casino sites? I’ve got a solution for that too – Winner Casino ! They run under software from PlayTech and also offer $/£30 in completely FREE credits credited instantly after joining! Note that US players are NOT accepted. CLICK HERE to Join!